C'mon - what other hope is there for it? It has scales all over it, for goodness' sake. And it's sea blue. See? It's a mermaid tail! It's for Kate. She doesn't know yet - and the nice thing about 2-year-olds is that you can make their Christmas present for them in plain sight and they won't guess it's for them. Better still, when we went shopping for the fleece and satin to complete it, I told Kate it was for a mermaid tail for her. "Hooway! I get to be Ariel for Halloween!" she cheered. And minutes later, she even forgot all about it. Attagirl, Kate! and the back -elasticized, so she can slip it on. when her feet aren't tucked into the tail fins. 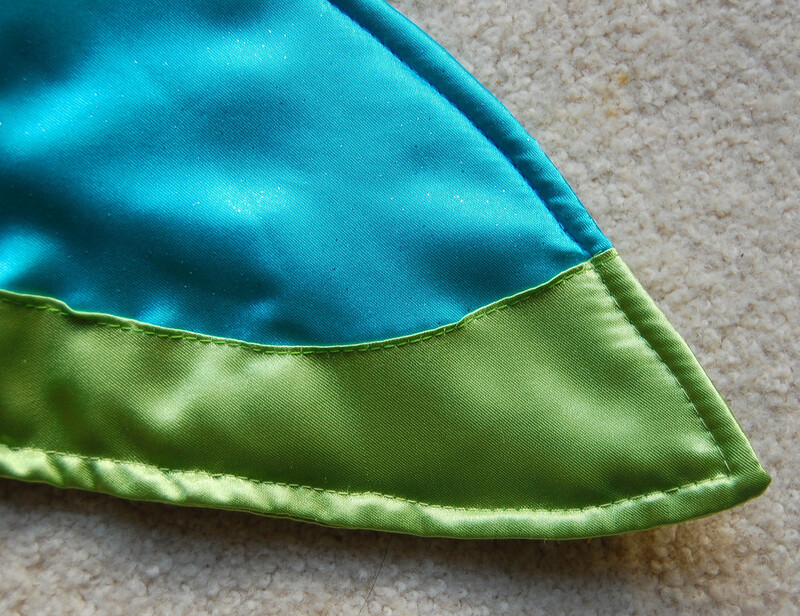 It is lined with fleece so it keeps its shape even without legs inside. Both the fleece and the shimmery-scales fabric are stretchy, so she'll be able to wiggle a lot in this tail. 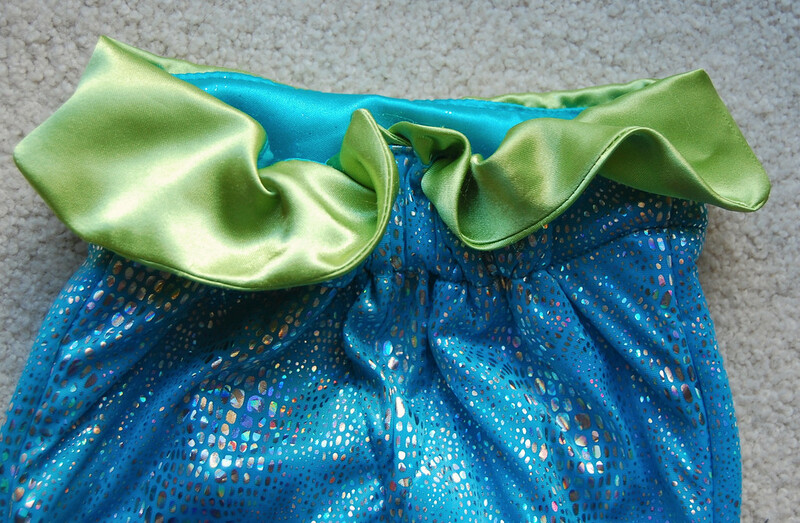 I must remember to make the um... bodice portion of the mermaid suit for Kate at some point. It's a strapless bikini top, isn't it? And yet I'm convinced it won't stay up by itself. Maybe if I made it entirely out of ribbing, like a 1980s tube top? Hmm. But that's another project for another day. P.S. Thank you, Kiera, for the Dinosaur suggestion! I never thought of reptilian-esque skin. Hurrah for you! I wonder if it's because my daughters-only brain is now programmed to only see pink, princesses and mermaids wherever I look. Thanks for the reveal! The suspense was killing me! Very, very cute, by the way. I miss having little ones to sew for. Of course it's a mermaid tail -- what else could it be? What a fabulous costume. Two years old is a wonderful age. Holy cow! 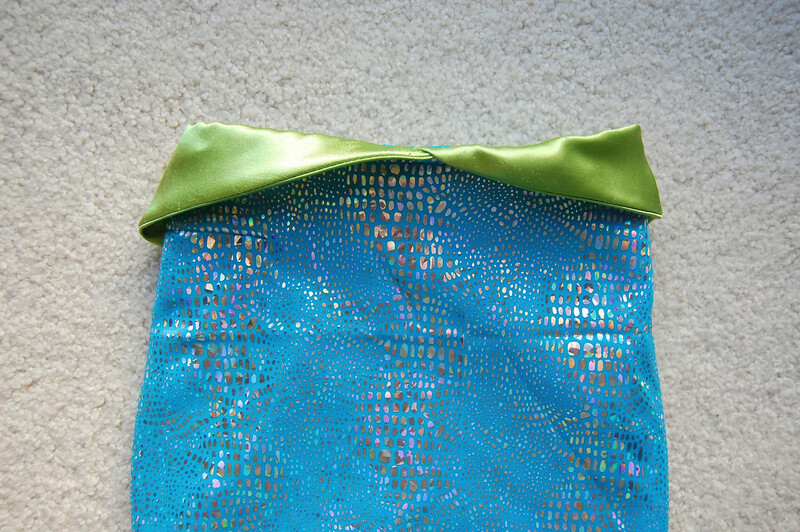 I knew it was going to be a mermaid tail, but had absolutely no idea how fabulous is was going to be! 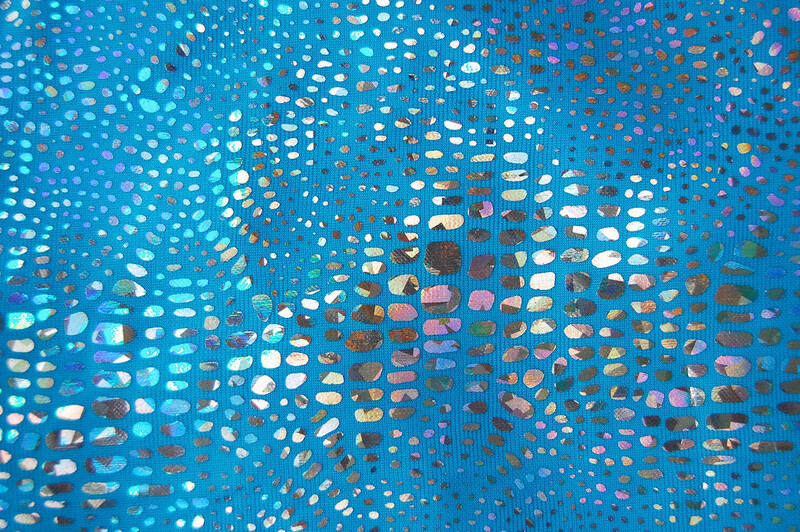 I had thought ocean but had not then gone the next step to mermaid - so obvious now! My 4 year old would love that, might have to attempt it! I have just been making alien outfits for a party as our dress ups are all princesses/fairies! fabulous! my 4yo would be so envious. she wrote santa that she wanted a mermaid for christmas. all summer in the pool she pretended she was a mermaid. i bet your daughter will love this! That's super cute. I was close, I thought 'fish'. Shame on me, with two small girls of my own! I can't imagine a top staying up without any straps but I have seen mermaid tops made as tshirts of skin colour fabric with the bikini appliqued on (or seamed in). I'd been wanting to make one of these for my 3 year old for ages but could never envisage a pattern. Thanks for the idea!! Love it, I know what you mean about the kids forgetting. Speaking to my 5 yo about presents for Daddy & her sister and how they should be secrets, she confidently said' It's ok Mummy I will have forgotten tomorrow!' and she did! .... well of course that would be it. Though with boys at home I was seeing Fish, Lizards and some pretty snazzy dinosaur skin. haha! I totally had NO idea! 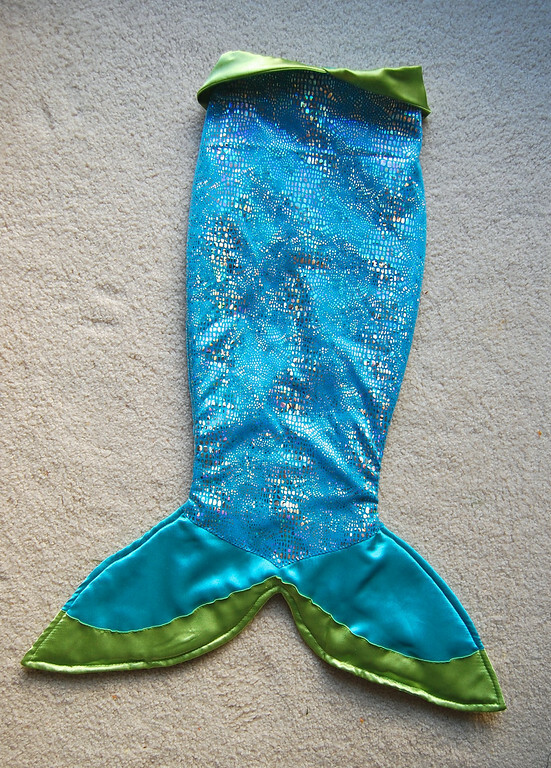 we have two little girls and I was absolutely clueless unless MAYBE it was a dinosaur, but my HUSBAND, of all people, goes, "oh, I bet she's gonna make a mermaid costume." come on! I should have totally seen that! haha great job! Hi--is there a pattern for this? It is brilliant! 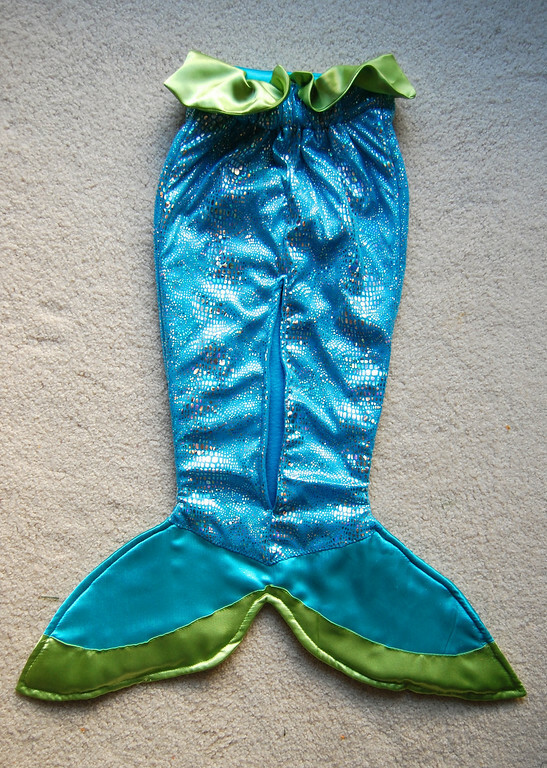 I'm looking for the pattern for this mermaid tail. Can you please tell me where I can find this at. I would like to make it for my granddaughters for Christmas. Thank you.